Sevan Locksmith is dedicated to providing fast response times, outstanding warranties, and the lowest prices in all of Seattle and surrounding areas.We strive to give our customers 100% satisfaction with every Seattle panic bar repair service we offer. All services are done by a licensed, local locksmith that is proud to give you the best price possible. Call us today at (206) 274-7061 for same day service and don’t forget to ask us about our online specials. Panic bars were invented in 1908 due to many incidents of people being trapped and unable to escape fires and stampedes. Following these events, the British government mandated that any building where people congregate in more than a certain occupancy must have some type of exit device that can be easily opened from the inside in case of emergency. Panic bar was the simplest answer to this, and still remain one of the most commonly installed emergency devices today. These type of lock allows people to leave a building quickly and easily. While panic bar is only required on certain buildings where the occupancy is deemed hazardous, such as a chemical plant, this lock is a great addition to any building where the occupancy and amount of doors do not even out. All styles and finishes available. We sale, install and service fire rated mechanical and electrified exit devices for commercial buildings, restaurants and warehouses. Our Seattle panic bar repair team can solve any lock issue you may have. Cylindrical type of panic bar is great for large buildings such as arenas, shopping malls, and concert halls. It also works great on smaller venues and for anyone who wants the safety of a panic bar with the security of a high security lock. This type of panic bar has a locking mechanism inside the actual bar instead of on the outside, making it more secure than a lever style bar. While most doors with panic bars do not have a lock or handle on the other side of the door, our Seattle panic bar repair team can install one or both on the spot if you want to be able to use the door for anything other than emergencies. 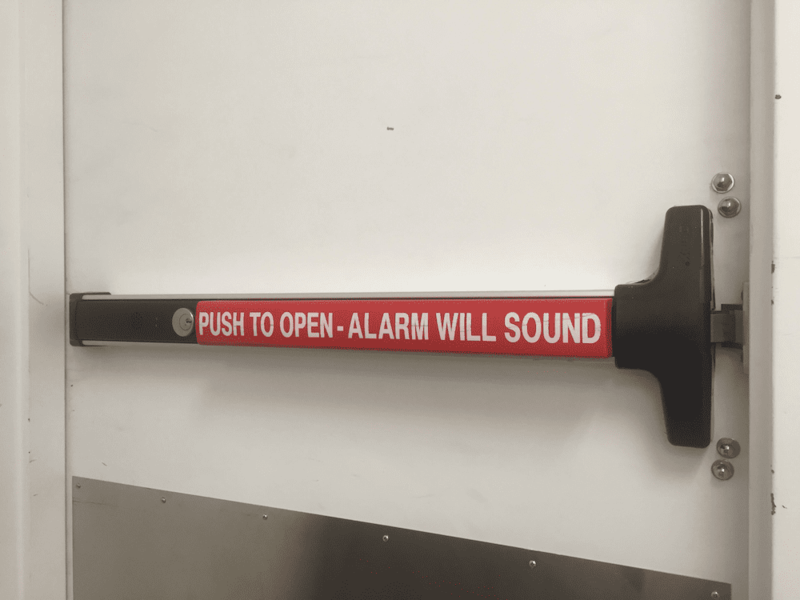 Alarm activated crash bar is a great addition to any building where you have a door that its sole use is for emergencies. This type of lock will automatically sound an alarm anytime the door is opened. This is not only a great lock for emergencies, it also doubles as a security measure as if anyone tried to open the door from the outside the alarm would also go off. Alarm activated crash bar can be installed on any door. Our Seattle panic bar repair team has all the tools and knowledge to complete the job the same day you call. Our contact number is (206).274.7061. Sevan Locksmith is available 7 days a week. We only use our in-house locksmiths on any job because the safety and security of your business is our number one priority. We are completely mobile so we can get your panic bar repair service done in no time. Call us today at (206)274-7061 to schedule an appointment, request emergency Seattle panic bar repair service, or to learn more about the different types of panic bars we carry. We only use top of the line brands with any Seattle panic bar repair service because the safety and security of your building is our business. Call our friendly local locksmith team today for service, our operators are standing by, and we never charge extra for nights or weekends.